RFTA passengers catch the bus in New Castle to avoid the early morning rush hour backups coming into Glenwood during the Grand Avenue bridge detour. Officials are finding new ways to give buses even more of a fast lane into and through Glenwood Springs for the next three months during the Grand Avenue bridge detour. On Thursday, Colorado Department of Transportation crews striped the right shoulder of Colorado 82 south of town, effectively extending the dedicated bus, employee van pool and emergency vehicle lane an extra 3 miles to the traffic signal near the Red Canyon turnoff. “With the backups we were seeing earlier in the week, we noticed several of the BRT buses waiting in the long line to get into town,” said Tom Newland, project public information manager for CDOT. Buses are key to getting commuters out of their cars during the three-month detour while the Grand Avenue bridge is replace. Project officials are trying to reduce by about 35 percent the usual traffic volumes of up to 1,800 vehicles per hour. Keeping buses on schedule is crucial, Newland said. The extra lane will allow buses, as well as emergency vehicles and permitted vans carrying six people or more, to sidestep the traffic that typically backs up during the weekday afternoon and evening commuter rush coming back through Glenwood into the congested detour route. The right lane of 82/Grand Avenue through Glenwood Springs to Eighth Street is also reserved for buses, EMS, employee vans and right turns only. “We’re looking at some other operational tweaks, but for now the bus lane is the major one,” Newland said. Meanwhile, RFTA noticed a marked increase in bus ridership on Wednesday and Thursday, following two days of gridlock on the detour route, and spilling over onto Midland Avenue at 27th Street, after the detour went into effect on Monday. 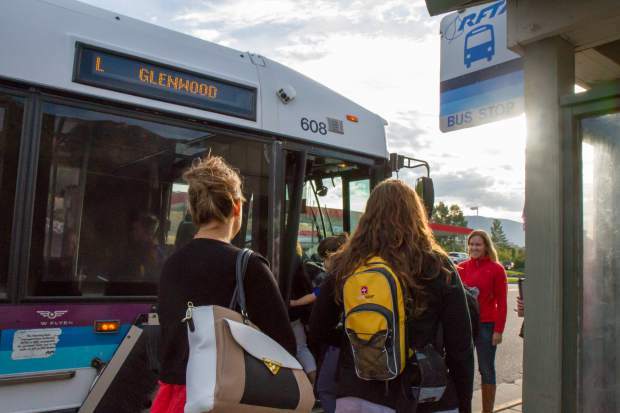 Especially the Hogback bus route between Parachute and Glenwood Springs, which is being provided free of cost to riders during the detour, has kept RFTA busy just trying to keep up with the growing morning and evening demand, said Kent Blackmer, co-director of operations for RFTA. Blackmer did not have any preliminary ridership numbers for the Hogback routes, which picks up starting in Parachute early in the morning and regular intervals and makes stops in Rifle, Silt and New Castle. Already, RFTA has adjusted its schedule during peak commuter hours on Hogback route from every 30 minutes to what’s essentially a continuous, on-demand schedule, Blackmer said. He said some buses have already been full by the time they hit Rifle, meaning extra buses must be on standby to handle additional riders waiting there and farther down the line. One challenge for the Hogback route has been with the buses heading back to the west after they drop off passengers on Sixth Street next to the downtown pedestrian bridge, and on the return home in the evening, Blackmer said. RFTA was initially sending those buses back down Sixth and U.S. 6, stopping at the Glenwood Springs Mall before hitting Interstate 70 at Exit 114. Those buses are now getting back on I-70 at Exit 116 to avoid backups at the West Glenwood roundabouts, he said. Anyone wanting to get from Sixth Street to West Glenwood is advised to take the free Ride Glenwood shuttle that runs along Donegan Road to the mall and back. The same demand issues have been true for the in-town shuttle route running between the Amtrak station on Seventh Street and the 27th Street Station, he said. The shuttle started off providing connections at 12-minute intervals during peak hours to the regular fare-based BRT and local bus service heading up valley from 27th Street to Carbondale, Basalt and Aspen. Since the start of the detour, though, RFTA has been providing essentially nonstop “bump-and-run” service, as Blackmer called it, at peak times through the middle part of town. “Fortunately, we do have the resources to meet the demand,” he said, adding that more drivers will be freed up after this weekend when the Aspen Music Festival and School routes cease operations for the season. “We’re so early into the game here, but we are adjusting as we have to,” Blackmer added. “Our traditional approach is to see how ridership patterns develop and then deploy a plan, but this is such a huge endeavor we’re making a lot of decisions along the way. “If we can get all these people out of their cars, then everybody benefits,” he said. Wednesday did seem to mark a turning point for people adjusting to the detour and determining if sitting in traffic for sometimes two hours through Glenwood Springs is worth it. A lot of word-of-mouth between people has steered a lot of commuters to try the bus, Blackmer said. Others have adjusted by leaving earlier or later to get to and from work, he said. Glenwood Springs Police Chief Terry Wilson said he wasn’t quite ready to call it a success in getting people to change their commuter habits. “I’ll want to see several more days of sample size to make any determinations,” he said. “I’m hoping that there has been some learning in these first few days about how difficult it is to get around, and that people are making the appropriate adjustments. “I’d say we’re still very much in the experimental stages,” Wilson said.